If you happen to be within reach of West Chester, Pennsylvania, a new musical about the Orioles and Deborah Chessler, entitled Soul Harmony, is running at Uptown Knauer Performing Arts Center until July 1st. As the show's publicity notes, after the success of Jersey Boys and Million Dollar Quartet, maybe now could be the moment for a doo wop musical; I certainly hope so. Chessler is undoubtedly worth the attention as she wrote It's Too Soon to Know, which started off the doo wop boom in 1948. "It told the story that had been forgotten. Around 2011, I called Greil and asked – is this woman still alive. Greil called her and asked if she wanted to talk with me. After that, she and I spoke for an hour each week for about two years. I have 100 pages of direct interview with her." the social context of the times, that of rigid segregation in an industry that often failed to take women seriously or treat black performers equally. Listening to the samples on the musical's website, there is a clear difference, at least to my ears, between the contemporary musical theatre style of the newly created numbers and the Orioles' material, so it will be interesting to see how these two strands are woven together. 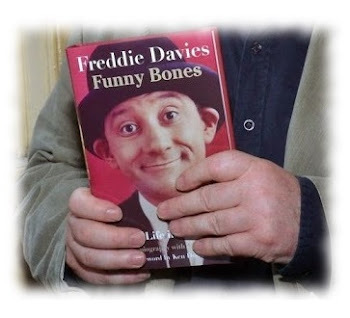 As this blog might suggest, my main interest is in the recreations of the 40s/50s material but the show was created, we're told, "for introduction to a broader audience", and if this combination draws more people in to learn about this pioneering group and their writer then that is all to the good. I once had a conversation with the son of a doo wop singer about why there hadn't yet been a really major doo wop musical - that is, only using songs of the period. True, examples of the genre feature early on in Jersey Boys but those crafted, bejewelled pieces of their pop heyday which dominate the show are something else entirely. The conclusion we eventually arrived at was that few of the well known vocal group songs had much in the way of narrative complexity - though I do recall that in the book Doo Wop: The Forgotten Third of Rock 'n' Roll there is a jokey attempt to chronicle a relationship entirely through the titles of well-known doo wop songs (To The Aisle, Three Steps From The Altar, etc). When a young Jewish singer/songwriter, Deborah Chessler, partnered with a dynamic black vocal group, The Orioles, they made history. Their #1 hit, “It’s Too Soon to Know”, gave birth to Rhythm & Blues, a new genre of music that ignited a generation. Deborah, Sonny and The Orioles were trailblazers, the R&B vocal group who "established the basic pattern for the Doo-Wop sound" (Rock and Roll Hall of Fame). More chart-topping songs, “Crying in The Chapel”, “Tell Me So”, and “Hold Me, Thrill Me, Kiss Me”, became part of an unforgettable story. Writers, Michael Allen Harrison and Alan Berg, set the stage for the sensational musical story in the social context of the times, that of rigid segregation in an industry that often failed to take women seriously or treat black performers equally. But Deborah and the Orioles had a sound and a stage presence that could not be suppressed. Their rise to music nobility was remarkable, as "race" songs crossed over into mainstream markets, and young fans of diverse backgrounds responded to the new sound. It is part of the American Story. Though long familiar with It's Too Soon to Know via a cover by the Ravens, I only became aware of its composer a few years ago when listening to Street Corner Soul, a BBC radio series about the rise of doo wop. Chessler, one of the main interviewees in the first programme, revealed that her songwriting stemmed from her efforts to make sense of her feelings after a disastrous early marriage. 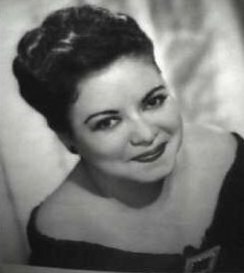 It's Too Soon to Know wasn't her first song, though earlier pieces apparently had similarly questioning titles and the same directness of expression which suited a more emotionally direct form of singing. The number which kickstarted the whole doo wop shebang - or shboom? - came about when a supportive male friend who offered to help pay for her divorce suddenly declared his love. Normally it's parents who counsel caution in these matters but Chessler's mother was all for it; it was Deborah who told her mother: "How can he love me? It's too soon to know." sang it like he had been singing it all his life. Here, for comparison, is that version by the Ravens. I remember dancing to it during the late eighties - during the day, dreamily, with one also caught up in the dream, which may explain my fondness for it. True, it's not so gospelly, not so direct as the Orioles' definitive recording, but it has a charm of its own: it certainly sounds Ravens-ish, rather than an attempt to do a straight copy. By the by, I wonder whether Deborah Chessler created that little verse at the beginning ("If she loves me she will tell me ...") or whether it was added by the group in order to bring Jimmy Ricks in more quickly, thus signalling to listeners that this version of the song - by a known quantity - would be the wiser purchase? I don't know how sales compared, though I'm guessing that the Orioles did rather better. I know the Ravens are responsible for another building block of doo wop, Count Every Star, on which Ricks' emulation of a double bass influenced a generation of singers, but it has to be admitted when placing the two performances of It's Too Soon ... alongside each other that the Ravens' performance lacks the intensity, the soulfulness, of Til's group. The Ravens are a kind of missing link, musically, between the Ink Spots and the Orioles: jazzier, looser than the Ink Spots, but capable of covering their songs, such as Bless You, without sounding drastically different. 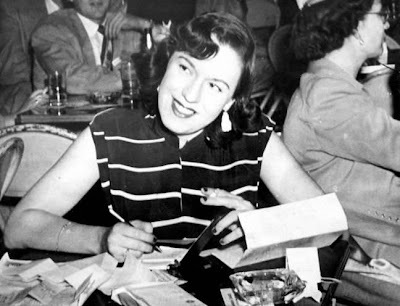 Her story was extraordinary in part because she was a young Jewish woman managing a black vocal group in an age when the entertainment industry, particularly in a Southern state like Maryland, was rigidly segregated. She and her mother toured with the group everywhere, including the South, dealing with booking agents, theater owners and other showbiz officials who were not used to taking women seriously or treating black performers equally. Virtually all that we know in rhythm and blues and soul harmony can be ultimately linked to Deborah Chessler and the Orioles. I am proud and happy to say that Deborah Chessler was our manager. She made it possible for the Orioles to become whatever we became because she managed us and she wrote a lot of the tunes which became big hits for us. "I was very tired of traveling at the time," she said. "There were reasons I wanted to stay home in Baltimore." One of those reasons was a man, whom Deborah had been seeing when she could. Now she felt it was time to make it more permanent. Actually, Deborah hadn't been going out on the road with the Orioles for a while. "We needed more work done in New York," she said. There was the booking agent to deal with, as well as picking out new songs for the group to record. [...] But even the work in New York got to be too much for Deborah. "I was tired; I wanted to stop. I didn't want to continue on like this. I called a meeting and told them how I felt." Fortunately, the guys appreciated the sacrifices she'd made over six years and they said "if that's what I wanted to do, I should do it." Deborah only briefly managed one other act: Randy Leeds, who had a single record on Roulette in 1959. She later moved to Wilmington, Del., and to Miami, where she performed as an extra in films. "There are times in your life when you‘re unhappy. Writing songs was my outlet, I loved writing songs: they came so fast, and they were through so fast. And I was always trying to make money." Her father died when she was nine, in 1932, at the trough of the Depression; Chessler and her mother were on their own, and their fear was missing the rent. "We were broke. My mother was ill a lot of the time, and money was very hard to come by.” Chessler`s mother sold women’s clothes; so did Deborah, once she began lying about her age. At fourteen she looked eighteen, and she took advantage. As a teen, she sold shoes at the old Kitty Kelly shop on West Lexington Street and immersed herself in Baltimore's popular music scene. "It wasn't a matter of who I was selling to - the main thing was to sell, because I got a commission. Ella Fitzgerald could buy ..."
"for thirty-five dollars, a lot of money" - to the organist at the Loews Century Theatre: a jingle celebrating the movie house’s new air conditioning. By the time the war ended, with Chessler in her early twenties, she was pressing harder. She sang her tunes for local disc jockeys. She couldn’t read music or play piano, but she found people to write out lead sheets. Some tunes were shtick [...] and some were verging on what twenty years later would be called soul music. "I liked what I wrote," she says. "That gave me the strength to go after it. I’d go to the backstages, if there was someone there who recorded, I’d knock on the door, introduce myself, tell them I had a song I thought was good for them, sing it to them. I went to the Hippodrome, the Century .I went to the Royal" - the heart of black night life, Baltimore’s version of the Apollo, except that in Baltimore there were no white hipsters or slummers in the audience, just a pretty white girl backstage who said she wrote songs. Looking to get a record made [Marcus continues], Chessler went from one person to another. A disc jockey sent her to Martha Tilton, a singer with the Benny Goodman band; she provided contacts in New York, in the Brill Building, the legendary center of the American music business - Tin Pan Alley. The result was "Tell Me So," Chessler's first recorded song, cut by Savannah Churchill, a leading black jazz singer known for her work with bandleader Benny Carter. The treatment was sterile, and the disc didn’t move. Chessler knew the song had more life in it; it was one of the first to really distill the personal disasters she was still trying to escape. She recites the opening lines today in plain speech, like an argument she means to settle: “lf you don't love me, tell me so. Don’t tell other people - I’m the one to know.” She went backstage at the Royal and sang the song to Dinah Washington, then on the verge of the long string of hits that would make her the preeminent female R&B singer in the years before Aretha Franklin. Washington's recording was stronger, but the composition would not truly flower until the Orioles made it a Number One R&B hit in l949. Their version was slow and aching - a tremendous emotional momentum building throughout the performance, and never let loose. Chessler was now a small name in Baltimore: a local girl whose tune you could actually hear on the radio. One evening she was home with her mother, and the phone rang: a man named Abe Schaeffer, saying he’d heard her name on the radio, that Chessler knew his sister-in-law Thelma, that he had five guys who wanted him to manage them, he’d made demos, he didn’t know what to do with them - could she help? Would she listen? The Vibranaires sang over the telephone. "l heard Sonny Til," Chessler says with bright eyes and a warm smile. "'Two Loves Have l.' He was so good - and the harmony behind him. So clear. They already had a style. My mind was working already: no way I wasn`t going to work with them." Schaeffer and Chessler worked together briefly, but she soon outdistanced him, and both he and the group realized the show was hers to run. She found the Vibranaires work in local clubs for little money, for exposure - off Pennsylvania Avenue. She was aiming for the mainstream, wherever it was. On 21 August 1948, It’s a Natural [aka Jubilee] released the Orioles’ first record, Chessler’s “It`s Too Soon to Know," backed by a quickie Chessler ditty called "Barbara Lee." Willie Bryant, a black DJ who with his white partner, Ray Carroll, had the late-night shift on WHOM, broadcasting out of a storefront in Harlem, put on "It’s Too Soon to Know" “The phones started ringing,” Chessler says. “I don’t think they ever took it off." [...] With instant cover versions from Ella Fitzgerald, Dinah Washington, the Ravens, a dozen others, some of them hits too, but falling short of the Orioles' Number One, the song drew a line. Nothing would ever be the same again. From this point on, in fits and starts, but with a new standard of value - the sincerity of marginalized, ghettoized voices from blues and country now confronting the entire nation, Hank Williams and Howlin` Wolf demanding that the nation respond in kind - people would seek what the Orioles had found. In their best moments they would refuse to settle for anything less. he sang it like he had been singing it all his life. 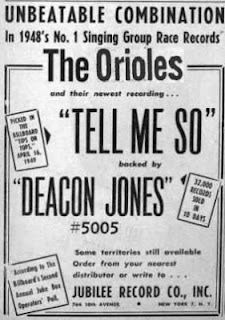 Other vocal groups of the '40s, like the Ink Spots or the Mills Brothers, sound composed, so arranged compared with the Orioles. 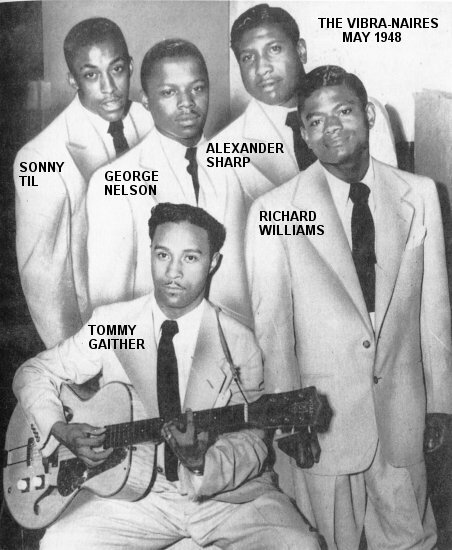 On "Too Soon," Sonny Til's lead tenor seems filled with fear and doom, forcing out each word - the others, Alexander Sharp, Johnny Reed and George Nelson, hum and moan behind him. Nelson briefly takes the lead, and then the song is Til's to haunt again. "It's Too Soon to Know" had an impact like a slap in the face. Never before had a pop group sung a love song so directly and honestly. Sonny Til's main influences, Nat King Cole, The Ink Spots, and The Mills Brothers, performed polished, dreamily orchestrated jazz ballads in which sentiments of pain, love, or loss were rather sanitized. Til, on the other hand, sang the part of the doubting, suspicious lover—"Is she foolin'? / Is it all a game? / Am I the fire or just another flame? "—with a passion that matched his words. But at the same time, his delivery was conversational, informal, with nothing of the neat polish of his predecessors, and no one had ever heard that before. The earthy street-corner sound of the city—what was still classified in Truman's postwar America as "race" music, with its challenge to uptown politeness—was coming to the mainstream and The Orioles were cutting-edge. One has to put one's self in the shoes of a pop fan at the dawn of the 1950s to understand aurally why Sonny Til and The Orioles were so important. "The biggest vocal group was The Ink Spots, and The Mills Brothers were popular too, but they had more of a white audience," says Marv Goldberg, a writer and historian of early rock and roll who interviewed The Orioles for his "R&B Notebook" article series published in 1999. "Sonny Til and The Orioles were different. Til was very handsome. By all accounts, when he got on stage he made love to the microphone, and the girls would just go wild." "It's Too Soon to Know" hit No. 13 on the pop charts and was a "race record" that earned a significant white audience. [...] "I think it was time for the less-polished sound," Goldberg continues. "Everyone was singing in the same mold. The Orioles weren't singing black pop music; they were doing something new." According to Goldberg, a lot of the singers in early black pop groups had studied music in college, and it came through in their sound. Sonny Til and The Orioles sang more laid-back R&B. Listening to their old records now, it's hard to imagine their sound ever seeming "new" - it's all doo-wop syllables and familiar pop harmonies undulating under Til's strident, tenor solo voice, like dozens of familiar oldies groups from The Skyliners to The Temptations - but when you listen to it alongside a group like The Ink Spots, the difference is stark. Sonny Til had unvarnished soul. Deborah Chessler is a woman who slipped in and out of history - making some, leaving the world slightly changed, then disappearing into it. All she and the Orioles left behind was the expressive power of a new, as-yet-unnamed, music -a power they were perhaps the first to define, and that in their own way they defined to the Full. "It was what we did," Chessler says bluntly. Ask her if she was a pioneer, and she'll tell you no. Ask her if she thinks of herself as someone who crossed racial boundaries, who challenged gender roles, who broke rules, and she’ll hoot at you. But she will tell you about a day in 1948, in New York City, when she found herself walking down Broadway, hearing "It’s Too Soon to Know" booming out of every music store, hearing people all around her singing it on the street, and admit that for a moment she felt part of a world she helped make. “Yes," she says. "Sure I did." 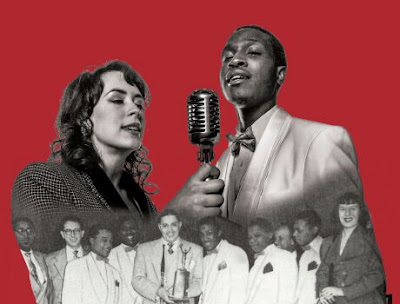 Soul Harmony: The Story of Deborah Chessler, Sonny Til & The Orioles, will be at Uptown! Knauer Performing Arts Center in West Chester until July 1st; details on the musical's dedicated website here. It is pleasing to note that the role of Sonny Til is being played by his grandson. Denny Dryoff's article on Soul Harmony in the Unionville Times here. Tribute to Deborah Chessler on the Classic Urban Harmony website here. New York Daily News obituary for Deborah Chessler here - thanks to Matt the Cat for alerting me to this; Baltimore Sun obituary here. Terry Whelan's Urbanite article on the Orioles here. 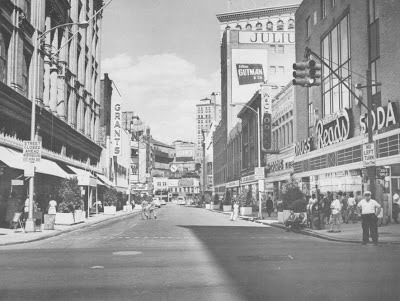 Marv Goldberg's The Orioles Part 1 here; the top image and the photo of the Vibranaires were taken from this site. If you aren't already aware of it, Marv's site is invaluable for all students of doo wop. 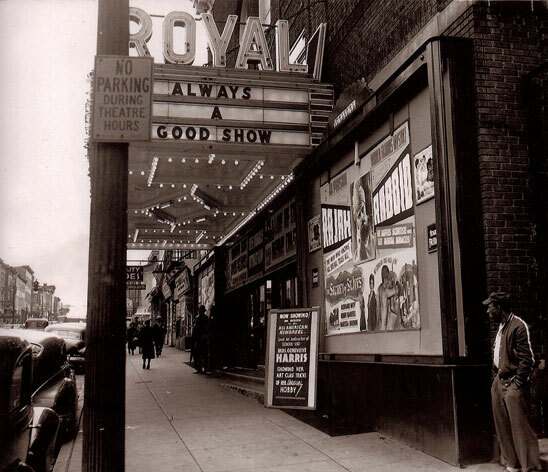 History of Baltimore's Royal Theatre and an account of a 2008 reunion here.